Jelly Belly came to public attention when it was revealed that they were President Reagan's favorite candy. Ronald Reagan was such a huge fan of Jelly Belly Jelly Beans that they were served at his 1981 inauguration. The Jelly Belly Company even invented a new flavor to be served, which was Blueberry. Three tons of jelly beans were served on that one day. They come in fifty different flavors with such names as jalapeno, very cherry, birthday cake, and hot buttered popcorn. The hot buttered popcorn flavor of Jelly Belly jelly beans is one of the top three most popular flavors. This jelly bean really tastes like hot buttered popcorn minus all of the high fat butter and the sky high movie popcorn price. This little jelly bean is white and yellow and color with a buttery flavor that comes alive in your mouth. It's a must try. 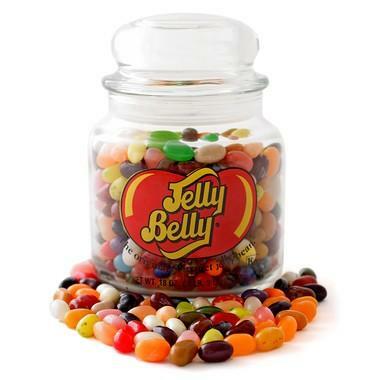 You can mix different flavors of Jelly Belly Jelly Beans to create a whole new flavor. On the Jelly Belly website you can find a link that has recipes and you can also find them in each package of this product. For example, two very cherry Jelly Belly beans with one chocolate pudding Jelly Belly bean gives you the taste of a chocolate covered cherry. And, each Jelly Belly Jelly Bean only has 1 calorie. That means you could sit down and eat 100 without feeling guilty. This is the perfect snack to have while dieting because the flavors are so similar to the foods they are supposed to be. This means you could have a Caramel Apple or Strawberry Cheesecake for only 1 calorie each. And Jelly Belly Jelly Beans are a popular item to tuck in plastic eggs for Easter egg hunts. The most popular place to put jelly beans though is still in an Easter basket. After all, what''s an Easter basket without jelly beans in it?